It’s cold in Chicago. Time to get my stew on. I really enjoyed the beef stew and bread combo from last year, but this time i wanted an easier to make bread. I went with the a soda bread (quick to make) but one with whole wheat (more hearty). 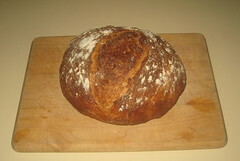 The bread turned out awesome – the consistancy was more like cornbread, went great with stew or just butter and jam. 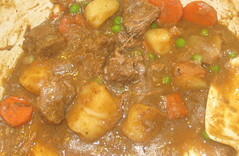 The stew was incredibly hearty (almost too meaty, very little liquid), had good flavor, but the potatoes and carrots were a bit mushy (next time might throw them in only for the last half of cooking). Converting from Slow cooking to an oven would be about 175 degrees for low setting and high is 250 to 275. (src). Low on Slow Cooker is 200 degrees, high is 300. Plus slow cookers need less liquid and less herbs (src). Low setting in a slow cooker takes about a quarter as long in a Dutch oven in a 325-degree oven. High setting takes about half as long. (src). (orig) Serves 6 to 8. Published February 1, 2007. Make sure to buy large chunks of stew meat. Trim meat of excess fat, as necessary, and cut into 11/2-inch pieces. Be gentle when stirring in the flour in step 3-the fork-tender beef will fall apart if stirred too aggressively. Make Ahead: You can prepare the recipe through step 2 the night before the ingredients go into the slow cooker. Refrigerate the browned beef and the onion mixture in separate containers. In the morning, transfer the beef and the onion mixture to the slow cooker and proceed with step 3. (orig) Yields 1 loaf. Published March 1, 1997. Unlike the Classic Irish Soda Bread Dough, which is dry, this dough is extremely sticky. Pat dough into a round about 6 inches in diameter and 2 inches high; place on greased or parchment-lined baking sheet or in cast-iron pot, if using. Place the loaf on a cookie sheet and cut a cross shape into the top. Bake until golden brown and a skewer inserted into center of loaf comes out clean or internal temperature reaches 190 degrees, 45 to 50 minutes. Remove from oven and brush with melted butter; cool to room temperature, 30 to 40 minutes. 1. Mix the dough with a fork until it just comes together. 2. Turn the dough out onto a work surface and knead just until loose flour gets incorporated; do not overknead. 3. Shape the dough into a six-inch round. 4. Place the loaf on a cookie sheet and cut a cross shape into the top. 5. For a golden crust that’s thin and crisp, with a bit of a chew, bake in a cast-iron pan. Makes one 8-inch Square. Published January 1, 2005. Before preparing the baking dish or any of the other ingredients, measure out the frozen kernels and let them stand at room temperature until needed. When corn is in season, fresh cooked kernels can be substituted for the frozen corn. This recipe was developed with Quaker yellow cornmeal; a stone-ground whole-grain cornmeal will work but will yield a drier and less tender cornbread. We prefer a Pyrex glass baking dish because it yields a nice golden-brown crust, but a metal baking dish (nonstick or traditional) will also work. The cornbread is best served warm; leftovers can be wrapped in foil and reheated in a 350-degree oven for 10 to 15 minutes. Adjust oven rack to middle position; heat oven to 400 degrees. Spray 8-inch-square baking dish with nonstick cooking spray. Whisk flour, cornmeal, baking powder, baking soda, cayenne, jalapeño, salt, and half of shredded cheddar in medium bowl until combined; set aside. In food processor or blender, process brown sugar, thawed corn kernels, and buttermilk until combined, about 5 seconds. Add eggs and process until well combined (corn lumps will remain), about 5 seconds longer. Using rubber spatula, make well in center of dry ingredients; pour wet ingredients into well. Begin folding dry ingredients into wet, giving mixture only a few turns to barely combine; add melted butter and continue folding until dry ingredients are just moistened. Pour batter into prepared baking dish; smooth surface with rubber spatula. Sprinkle remaining cheddar over batter. Bake until deep golden brown and toothpick inserted in center comes out clean, 25 to 35 minutes. Cool on wire rack 10 minutes; invert cornbread onto wire rack, then turn right side up and continue to cool until warm, about 10 minutes longer. Cut into pieces and serve. 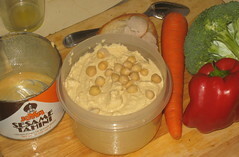 I love me some hummus – Its such a great healthy snack with raw vegies or breads (pita, pretzels). I made the following recipe 3 times now, each time it was awesome. The fresh lemon really makes it stand out from store-bought hummus. This last time a put a bit more garlic and red pepper in, i think it was an improvement. Hummus recipe from cooksillustrated.com, picture is mine. Note on creamy textures – I use a 40 oz blender, since I don’t have a food processor. I double the recipe, spending extra time blending the chickpeas in the first step, pushing the chickpeas down, blend for 2 secs, repeat. After half the chickpeas are smashed, i add half the lemon water, blend till all chickpeas are smashed, slowly adding rest of water making sure to have a smooth texture before adding tahini and oil. 1. Combine lemon juice and water in small bowl or measuring cup. Whisk together tahini and 2 tablespoons oil in second small bowl or measuring cup. Set aside 2 tablespoons chickpeas for garnish. 2. Process remaining chickpeas, garlic, salt, cumin, and cayenne in food processor until almost fully ground, about 15 seconds. Scrape down bowl with rubber spatula. With machine running, add lemon juice-water mixture in steady stream through feed tube. Scrape down bowl and continue to process for 1 minute. With machine running, add oil-tahini mixture in steady stream through feed tube; continue to process until hummus is smooth and creamy, about 15 seconds, scraping down bowl as needed. 3. Transfer hummus to serving bowl, sprinkle reserved chickpeas and cilantro over surface, cover with plastic wrap, and let stand until flavors meld, at least 30 minutes. Drizzle with olive oil and serve. We recommend Joyva or Krinos tahini and Pastene/Goya chickpeas (see related tastings). The hummus can be refrigerated in an airtight container for 5 days. If you do not plan on serving it immediately, refrigerate the hummus and garnishes separately. When ready to serve, stir in approximately 1 tablespoon of warm water if the texture is too thick. Shayna and I decided recently that we’re gonna have no alcohol for the month of april. Wha?? I know, i know. I enjoy a delicious Racer 5 beer as much as the next guy, but i like to change things up. Plus i’ve been running alot and maybe this will get me to my next level – so i’m ready for the SF Marathon August 3. Our friends Jason and Monica did it in January – and they felt great. Now its our turn. We still got the last weekend in March to have a brewski (or seven) down in LA. Thats right, going to LA this weekend with Juan (birthday Friday 28th). So untill April .. Bring it. Yesterday i had way too much cheddar cheese in the fridge so i decided to make some Cheese Bread. HOLY SCRUMPTIALICIOUS! This another one of my favorites from Cooks Illustrated. Less than 2 hours from idea to eating – so good i have to share the love. Run-of-the-mill cheese bread is at once dry and greasy, with fleeting cheese flavor. We were after something different: a rich, moist loaf topped with a bold, cheesy crust. If using Asiago, choose a mild supermarket cheese that yields to pressure when pressed. Aged Asiago that is as firm as Parmesan is too sharp and piquant for this bread. If, when testing the bread for doneness, the toothpick comes out with what looks like uncooked batter clinging to it, try again in a different–but still central–spot; if the toothpick hits a pocket of cheese, it may give a false reading. The texture of the bread improves as it cools, so resist the urge to slice the loaf while it is piping hot. Leftover cheese bread is excellent toasted; toast slices in a toaster oven or on a baking sheet in a 425-degree oven for 5 to 10 minutes, not in a conventional toaster, where bits of cheese may melt, burn, and make a mess. Our cheese bread is best made with whole milk, but it will taste fine if you have only 2 percent milk on hand. Do not use skim milk. 1. Adjust oven rack to middle position; heat oven to 350 degrees. Spray 5 by 9-inch loaf pan with nonstick cooking spray, then sprinkle 1/2 cup Parmesan evenly in bottom of pan. 2. In large bowl, whisk flour, baking powder, cayenne, salt, and pepper to combine. Using rubber spatula, mix in cheddar or Asiago, breaking up clumps, until cheese is coated with flour. In medium bowl, whisk together milk, melted butter, egg, and sour cream. Using rubber spatula, gently fold wet ingredients into dry ingredients until just combined (batter will be heavy and thick). Do not overmix. Scrape batter into prepared loaf pan; spread to sides of pan and level surface with rubber spatula. Sprinkle remaining 1/2 cup Parmesan evenly over surface. 3. Bake until deep golden brown and toothpick or skewer inserted in center of loaf comes out clean, 45 to 50 minutes. Cool in pan on wire rack 5 minutes; invert loaf from pan and continue to cool until warm, about 45 minutes. Cut into slices and serve. 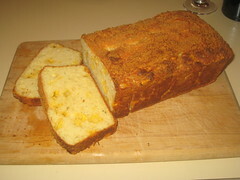 Freezing Instructions: Although the recipe title Quick Cheese Bread is no misnomer (the batter is in the pan in 15 minutes), when you add time for baking and cooling, the recipe does require a total of two hours. Luckily, like many of our other bread recipes, a baked loaf of cheese bread freezes beautifully, meaning a warm loaf need be only minutes away. To freeze the bread, wrap the cooled loaf tightly with a double layer of aluminum foil and place in the freezer; it will keep for up to three months. When you’re ready to serve the bread, place the frozen, wrapped loaf on the middle rack of a preheated 375-degree oven and heat for eight to 10 minutes, until the loaf yields under gentle pressure. Remove the foil and return the unwrapped bread to the oven for five minutes to crisp the exterior. Take the bread out of the oven and let cool on a rack for 15 minutes to make slicing easier. Enjoy. I’ve already mentioned I love cooking, and I finally got a Dutch Oven. A heavy, cast-iron pot that provides even heating on the stove or in the oven. Cooks Illustrated recommended Tramontina 6.5 quart as their best buy – and i found it for $60 at target (labeled chefmate caserole dish). So with this beautiful piece of equipment i made some fresh homemade bread and a hearty beef stew. Both turned out beautifully and to rave reviews of my friends. I’d definitely do the stew again (or slight variation), but the bread was a bit more work than I think necessary – required 2 days of work. Here’s the recipes from cooksillustrated.com and pictures of my final product. 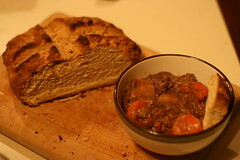 Variations: Guineess Beef Stew, Irish Brown Soda Bread. Make this stew in a large, heavy-bottomed soup kettle measuring at least ten inches in diameter. If the kettle is any smaller, you may need to cook the meat in three batches rather than two. 1. Heat oven to 300 degrees. Place beef cubes in large bowl. Sprinkle with salt and pepper; toss to coat. Heat 2 tablespoons of the oil over medium-high heat in large nonreactive soup kettle; add beef to kettle in two separate batches. Brown meat on all sides, about 5 minutes per batch, adding remaining tablespoon of oil if needed. Remove meat and set aside. Add onions to now empty kettle; sauté until almost softened, 4 to 5 minutes. Reduce heat to medium and add garlic; continue to sauté about 30 seconds longer. Stir in flour; cook until lightly colored, 1 to 2 minutes. Add wine, scraping up any browned bits that may have stuck to kettle. Add stock, bay leaves, and thyme; bring to simmer. Add meat; return to simmer. Cover and place in oven; simmer about 1 hour. 3. Add peas and allow to stand 5 minutes. Stir in parsley, adjust seasonings, and serve. An enameled cast-iron Dutch oven with a tight-fitting lid yields best results, but the recipe also works in a regular cast-iron Dutch oven or heavy stockpot. (See the related information in “Making Your Dutch Oven Safe for High-Heat Baking” for information on converting Dutch oven handles to work safely in a hot oven.) 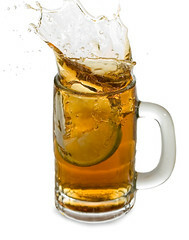 Use a mild-flavored lager, such as Budweiser (mild non-alcoholic lager also works). The bread is best eaten the day it is baked but can be wrapped in aluminum foil and stored in a cool, dry place for up to 2 days. 1. Whisk flours, yeast, and salt in large bowl. Stir honey into water, then add water, beer, and vinegar to the dry ingredients. Using rubber spatula, fold mixture, scraping up dry flour from bottom of bowl until shaggy ball forms. Cover bowl with plastic wrap and let sit at room temperature for 8 to 18 hours. I’m totally loving my new food magazine, Cooks Illustrated, from the show, America’s Test Kitchen. If you like cooking, and haven’t heard of it .. get on it. Thanks to Checkoway and Tim for the 411. The magazine’s website, cooksillustrated.com, contains all the recipes from the magazaines with a nice search – makes it easy to look up recipes when you want to make something with a couple of ingredients. What separates these guys from the rest is their thorough, scientific approach to recipes. For example, they often take classic recipes, like homemade bread, and make a dozen versions, each one slightly different, in order to ascertain the effects. They will often have multiple tasters as well, giving feedback. This leads to better recipes and food, but more importantly, it helps explain the purpose of the different ingredients. Ever wondered why some bread might be more dense? fluffy but small air pockets vs big air pockets? crisp crust? chewey crust? I know you have. Besides the magazines and the show, they also have tons of books. I’ve bought 3 – New Best Recipe (2004), Family Cookbook (2006), and 2008 Best Of. The first 2 have over a 1,000 recipes and are a greatest hits. However, the first one doesn’t have pretty pictures like the second or third one. But the second one doesn’t have as lengthy recipe introductions as the first and third. Those lengthy intro’s are what i like – they give background as to what they were looking for when “perfecting” a recipe. All 3 also talk about equipment, as well. So which one should you get? If you want a reference, Family cookbook – it also has binders so you can pull out the page the recipe is on. If you want just a handful of good recipes (good intro), get the last book. But if you don’t need pretty food pictures and like lots of information, get the first one. I like having both of the first 2, but if you had to have just one, i’d go with the third – 2008 Best Of. Expect alot more blogs on food and recipes as i go thru these books. I never would have guessed it 10 years ago, but i love me some high fiber cereal. Don’t get me wrong, bacon is still king, but 4-5 times a week i have the following breakfast: Non-fat Yogurt, high-fiber cereal, and dried fruit (I prefer Trader Joe’s dried berry medley of blueberries, strawberries, and cherries). No really, it tastes great .. and gives me energy all morning. As you noticed, i slipped in grams of protein, too, cuz, that sorta matters. Other things matter too, such as organic/health ingredients. Thats why i eat Smart Bran by Nature’s Path. I just don’t trust those big companies .. i mean, really General Mills, who wants aspartame, aka sweet-n-low, in their fiber one? More Fiber Cereals by CNN. Why high-fiber? Initially I did it cuz i had a great uncle that had colon cancer. But as it turns out, those old studies were .. not accurate. Recent studies show no link between fiber-diet and colon cancer (src), but maybe (src). However, high-fiber diet is great for many other things – for lowering cholersterol (which my family also has high amounts of), preventing heart disease, preventing type 2 diabetes, and relieving constipation. On average, males age 14-50 need 38g of fiber a day, females 9-50 need 25g per day (src).